SHOW THE WORLD WHAT A DIFFERENCE FALCONS CAN MAKE IN ONE DAY! Save the date for our third BGSU One Day – an inspiring 36-hour event for alumni, students, faculty, staff, parents and friends to come together to support Bowling Green State University. On April 2-3, Falcons can give back and pay forward in support of their favorite cause, college or program. The collective power of Falcon philanthropy will change lives for the world when you join us for BGSU One Day on April 2-3. Can’t wait to show your support? Make your gift in advance of BGSU One Day. Make a BGSU One Day Match or Challenge gift. Sign up to be a BGSU One Day Ambassador. Join the BGSU One Day Ambassador Facebook page. 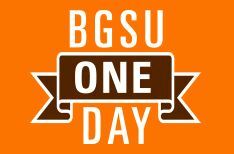 Print a BGSU One Day selfie sign and post on social media using #bgsuoneday to show your support! Be sure to check back as Match and Challenge gifts will be added until BGSU One Day!